Janet is a London based artist, with a flair for bringing lively characters to life. She has been drawing ever since she could grab a crayon, and nowadays she is often inspired her toddlers' cheeky antics. Janet also loves to write and illustrate her own ideas for children and illustrates using pencils, paint and Photoshop techniques. A friendly smile and a simple "hello" set the stage for a lifetime of friendships. 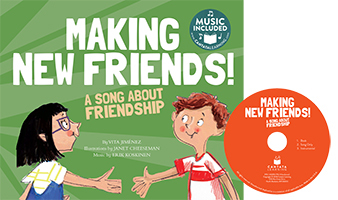 Kids learn how to make friends with a catchy song and colorful illustrations that support the upbeat lyrics. Making New Friends! is aligned with Early Learning Science Standards. This hardcover book comes with CD and online music access.